﻿PHILADELPHIA (Embargoed until 1:30 p.m. EDT, Sunday, June 24, 2018) – Research presented at the 2018 Annual Meeting of the Society of Nuclear Medicine and Molecular Imaging (SNMMI) shows that combining targeted radionuclide therapy with immunotherapy could improve the survival of patients with metastatic melanoma. Immunotherapies, which use the patient’s immune system to fight disease, have increased the survival of many advanced-stage cancer patients. However, for most patients their cancer will either not respond or initially respond but subsequently become resistant to immunotherapy. For the study, a mouse model of melanoma was used. The mice were initially administered yttrium-86 (86Y)-NM600 and had PET/CT scans at 3, 21 and 48 hours post injection to determine the proper activity of yttrium-90 (90Y)-NM600, the TRT agent, that would need to be injected to deliver a desired dose of radiation to the tumor microenvironment(s). Mice treated with the combination of 90Y-NM600 and anti-CTLA-4 immunotherapy showed tumor regression and improved survival compared to other treatment groups, with 66 percent exhibiting a durable complete tumor response. Hernandez and key coauthor Ravi Patel, MD, PHD, noted that this study took a multifaceted approach to combined TRT/immunotherapy research, which involved close collaboration with immunology, radiation oncology, dosimetry and imaging researchers at the University of Wisconsin-Madison. Such interdisciplinary collaboration is key to advancing new therapies, and NM600 has potential applications for diverse cancers. NM600 selectively targets murine melanomas in vivo. 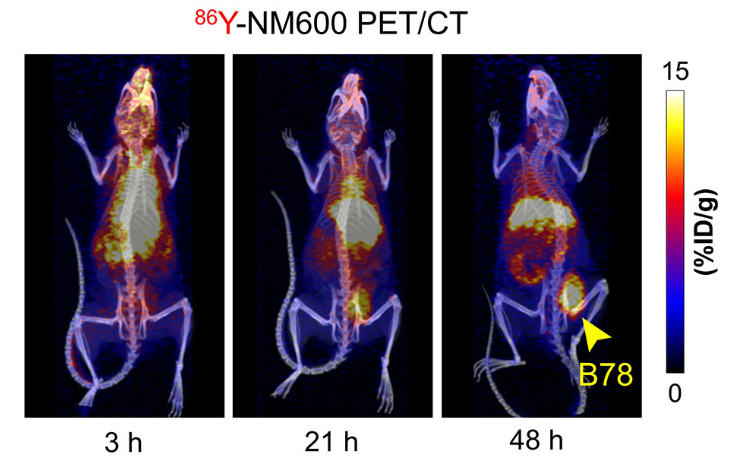 PET/CT imaging shows selective and prolonged retention of NM600 labeled with Yttrium-86 –a PET imaging isotope– in tumors while clearing from other normal organs and tissues. Credit: R Hernandez, R Patel, et al., University of Wisconsin-Madison, Madison, WI. Abstract 119: “Combination of Targeted Radionuclide Therapy and Checkpoint Blockade Augments Therapeutic Response in a Syngeneic Murine Model of Melanoma,” Reinier Hernandez, PhD, Ravi Patel, Joseph J. Grudzinski, PhD, Peter Carlson, Raghava Sriramaneni, Ryan Brown, Bryan Bednarz, Paul Sondel, Zachary Morris, Jamey Weichert, PhD, University of Wisconsin-Madison, Madison, WI. SNMMI’s 65th Annual Meeting, June 23-26, Philadelphia.